Yea….that’s the spiel I’ve been giving for the past 4 years. My plan in the beginning was to slowly phase out of the salon over the course of 5 years. Here we are 4 years later and my last day was yesterday. This has been such an incredible journey of self discovery so far and we are only now at the true beginning. I feel so free and motivated. To everyone that has gotten me this far so fast – my mentors, clients, educators, husband, family and friends – thank you. You can’t imagine how much you just believing in me or taking a chance on me has meant for my life. You saw something in me and you helped me to open my eyes and see it too. To my husband Jimmy, I know this leap is so scary for you but you have done nothing but believe in me and support my decisions. You are my backbone and my strength. You knew the sacrifices that are in store for us as a family but still you said “I’m tired of seeing you so unhappy, just quit, we will figure it out baby.” I love you so much. Thank you for going down this rabbit hole with me. And to Kathleen, there are no words that can describe how you have changed my life. What ever it was that (finally) made you take me under your wing 4 years ago, I am eternally grateful for it. You are my greatest mentor and one of the best friends I have ever had. This thing that we are doing is the most important thing that I have ever done in my life and I couldn’t think of anyone else I would want (or be able to lol) do it with. There is so much in store for us and the community that we nurture. I just can’t wait. 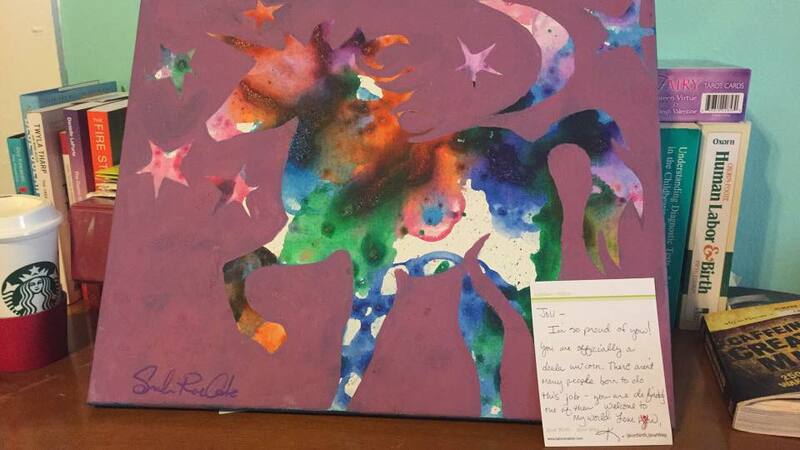 Also…THANK YOU FOR MY DOULA UNICORN PAINTING!!!!!!!!!!!!!! ❤️???? ?